In Arabia, where cats have been sacred since the sixth century, there springs the myth of Muhammad's cat Muezza, the first nine-lived cat in history. It is said that when the cat was asleep on the Sleeve of Muhammad's robe, rather than disturb the cat Muhammad cut off the sleeve so the cat could sleep on. When Mohammad returned, Muezza bowed in a gesture of appreciation. Mohammad then stroked Muezza three times down the length of the back, which, according to some myths, is the thing that puts cats safely on their feet when they fall. Noted for its intelligence, this slender-bodied cat enjoys a good romp, and is equally famed for its ability to play. The cat is affectionate, soft voiced, and friendly. Its tail, long and tapered, curves back to the days of Solomon and Sheba. So legendary an animal must know things that we cannot fathom. There is an African expression: "What you don't know is wiser than you." The Earliest Abyssinian taken to Britain was called "Zula". Its owner was the wife of captain Barrett-Lennard and its picture appeared in a book published in 1874. Zula bears little resemblance to today's Abyssinians. The source of the name is not because Ethiopia, formerly Abyssinia, is thought to be the original home of these cats, but because the first "Abyssinian" exhibited at a show in England was reported to have been imported from that country. The cats came to Europe with soldiers returning from the Abyssinian War in 1868, In Britain they were crossed with British Shorthairs to create the modern version and quickly became recognised as a competitive breed. Aby owner describes these cats as; "A very people-oriented cat. Not a lap cat - but a cat that likes to be with people, a cat that wants to know what you are doing - that wants to help. There is probably no breed anywhere more loyal than the Aby. Once you have acquired an Aby as a companion, you will never be able to complain that no one understands you. Abys are very good at training people to do just what they want them to do." Ticked hairs with two or more bands of colour comprise the coat, The overall colour is ruddy, but crosses have also created red and blue varieties. 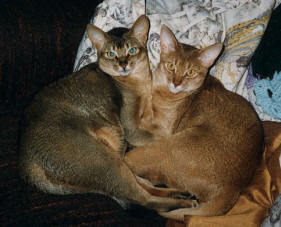 Italian breeders have developed a similar breed called the Wild Abyssinian.